Hey friends – are you ready for Valentine’s Day (or Gal-entines Day!) tomorrow? Whether you’re spending the day with a significant other, family member, or friend, cooking for them is always a nice way to show you care. I originally shared this healthy Valentine’s Day recipes post a few years ago, but I’ve updated it with a bunch of new recipes and ideas. Enjoy! These easy vegan scones are impressive and delicious enough to serve for a special Valentine’s Day breakfast! 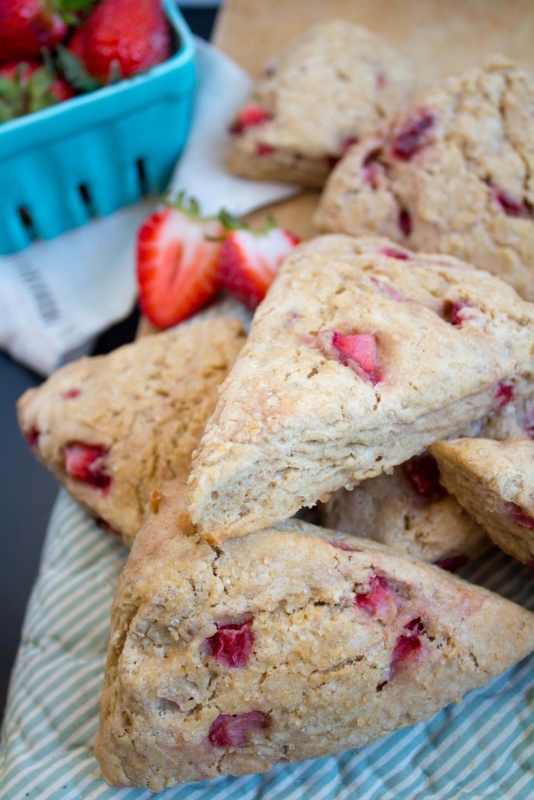 If you get to sleep in this Valentine’s Day, serve these scones alongside eggs, fruit, and coffee for a beautiful breakfast in bed. Or grab one on the go – it would pair well with a latte for some added protein! No time to lounge around in the morning? 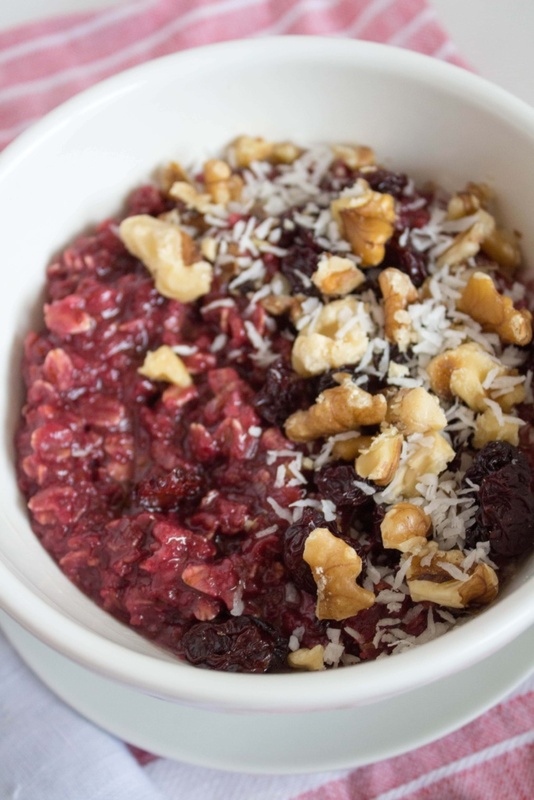 This super quick microwave oatmeal gets its vibrant pink color from tart cherry juice, which adds flavor and an antioxidant boost. It’s perfect if you’ll be on the run tomorrow morning, but still want to make a festive breakfast! I love savory breakfasts like my go-to avocado toast with a fried egg, but sometimes it’s nice to switch it up a bit! 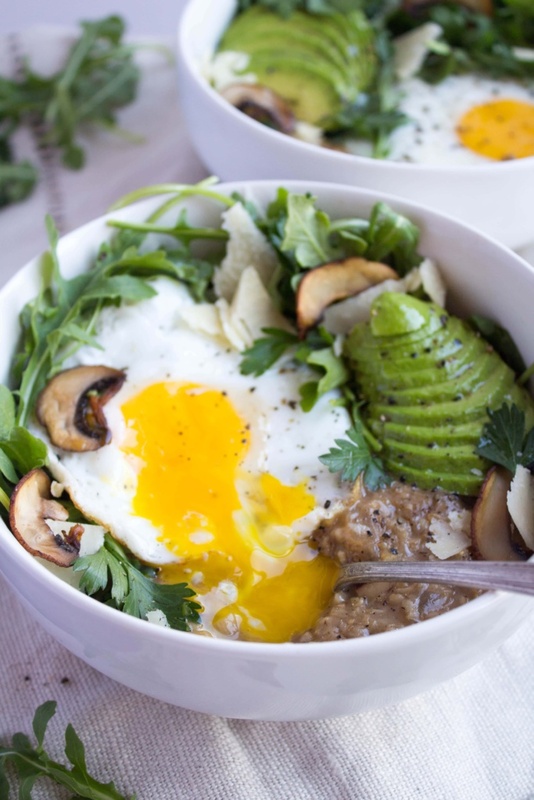 This savory oatmeal is so gorgeous and unexpected that it makes a perfect breakfast for special occasions. This dish is very pink so that makes it Valentine’s Day themed, right? I know it’s not exactly grill weather, so feel free to use a grill pan instead – whatever works! 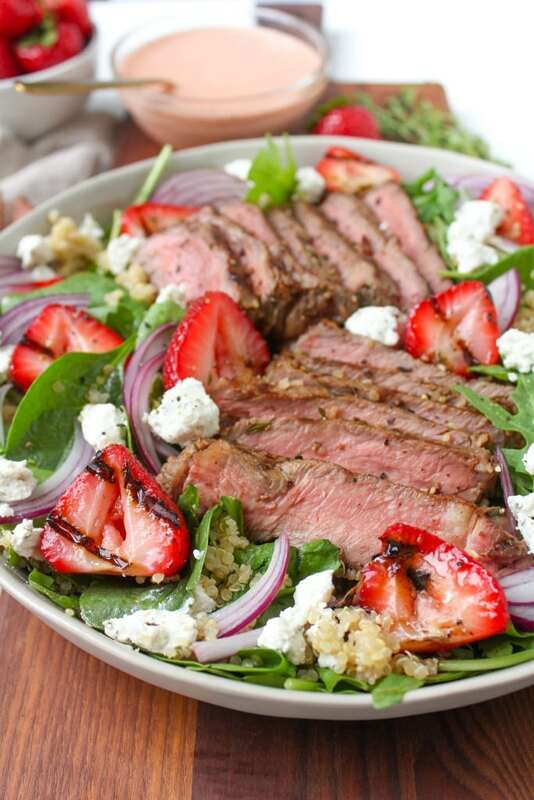 Just don’t skip the strawberries – they make this salad. 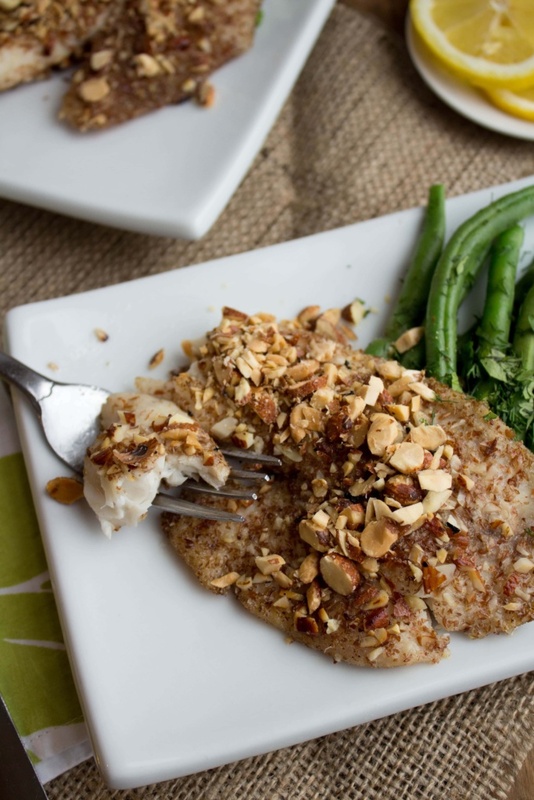 Fish definitely tops my list of most impressive dinners, and this foolproof recipe packs in a ton of flavor with the crunchy almond crust! Serve it alongside veggies (like my Lemon Garlic String Beans or Garlic Herb Roasted Veggies) and roasted potatoes or quinoa for a colorful, balanced meal. This is another one of my go-to fish recipes that’s as beautiful as it is easy! 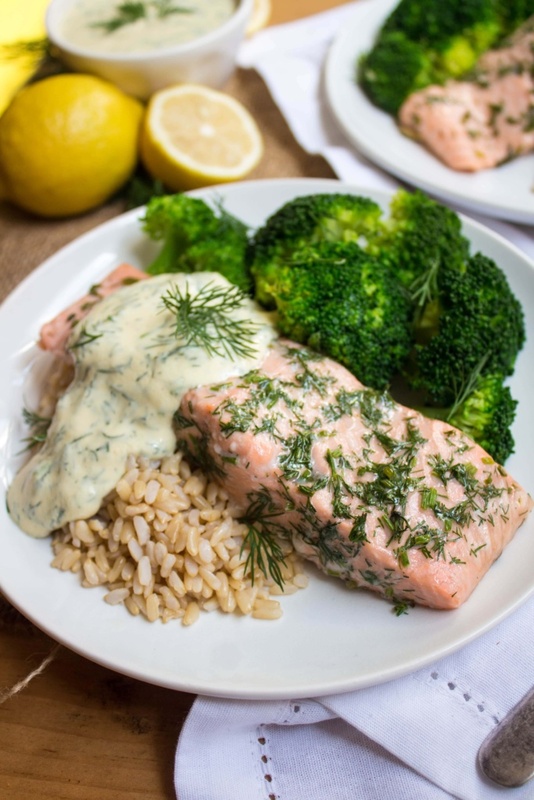 The simple lemon mustard dill sauce definitely makes this dish – it packs in a ton of flavor and makes the dish feel fancy, while remaining healthy and quick. It’s also so delicious I want to eat it with a spoon! This is Matt’s favorite salmon recipe – he requests it often, which says a lot since he’s still not a huge fish person! If you want to make an extra special Valentine’s Day meal, this recipe is the one for you! 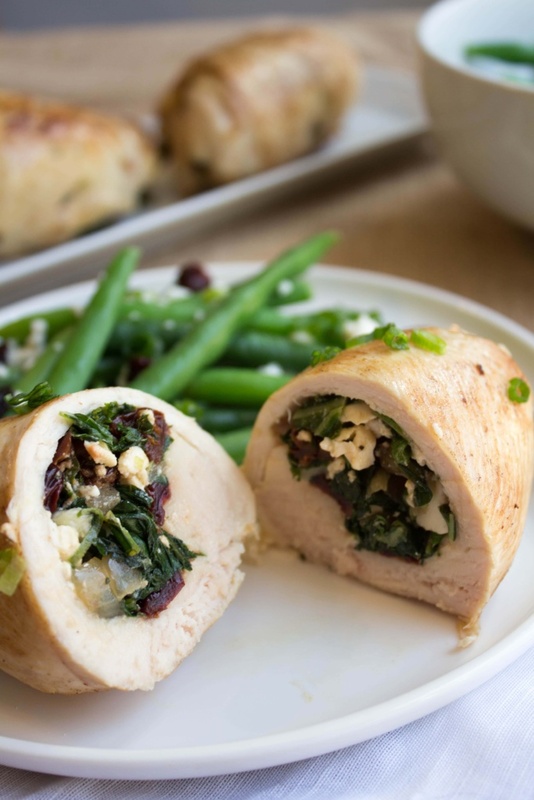 Stuffing the chicken makes it look like you’ve spent tons of time and effort on dinner, but it’s such an easy meal to throw together. I love using my crockpot to make rich, flavorful meals with minimal effort. 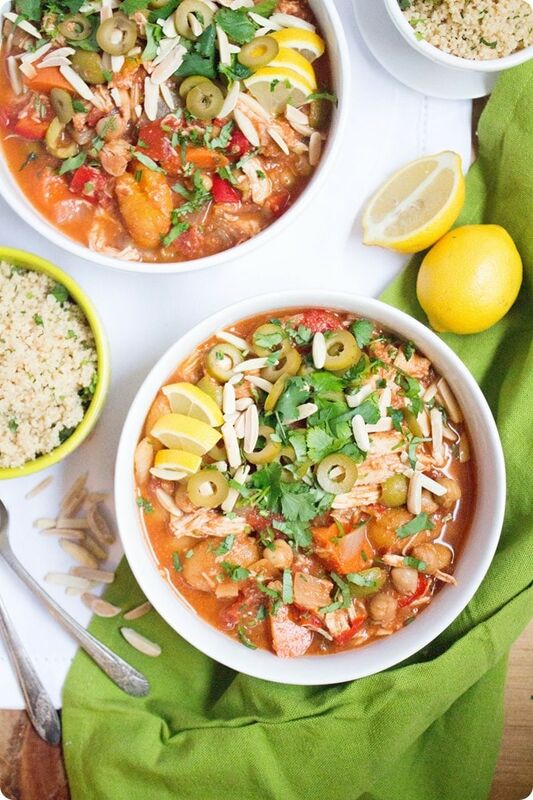 Set the slow cooker in the morning and come home to a romantic meal! Enough dinner ideas – let’s talk dessert! 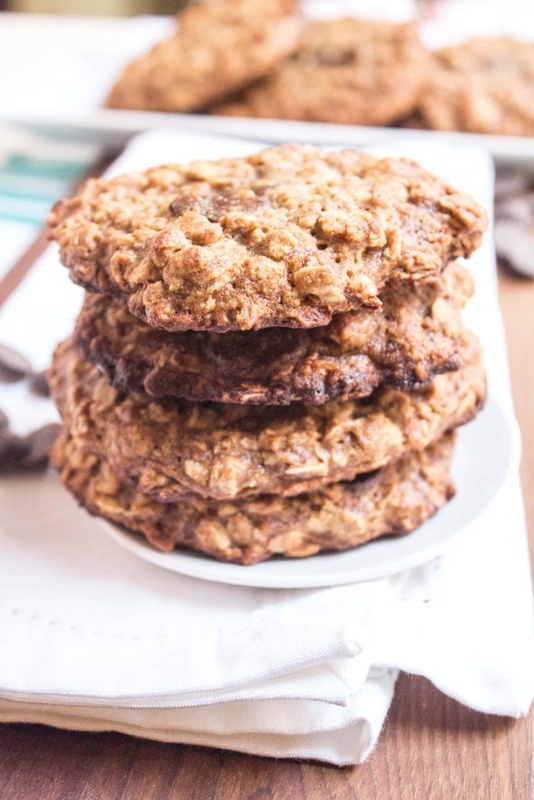 These chocolate chip cookies are more nutrient packed than your average cookie, but they still have that crispy-on-the-outside, chewy-on-the-inside texture that makes chocolate chip cookies the perfect dessert. Want to go more decadent? Try these chocolate covered cherry cookies – the photos are terrible so I won’t share those here, but they are my absolute favorite cookies of all time. So rich. I hope you enjoyed this round up of healthy Valentine’s Day recipes! What will you be making for Valentine’s Day (or Gal-entine’s Day!) tomorrow? I love going out to eat, but my favorite Valentine’s with Matt was probably one we had way back in the day (2005 or 2006?). He was living in a big group house with a bunch of guys, but wanted to make us a romantic dinner at his place without his roommates busting into the middle of it, so he brought a small table down into his basement room and set it up all pretty for us. It was so sweet because of all the effort he put in! I don’t remember what we ate but I’m sure the food was good, too. I’m lucky that Matt loves to cook! And speaking of, another fave was our home-cooked 2012 Valentine’s Day in Chapel Hill. Those cinnamon roll muffins Matt made us were awesome… but omg that kitchen mess! Ha. Always looking for new ways to prepare Salmon. This looks great. Lots of yummy ideas! I think scones are one of my favorite desserts in this world! I really love them too! The salmon and the steak menus look particularly good!